/ What Is a Purge Mask? What Is a Purge Mask? Every couple of years, new designs and features get added to the scuba gear market. From updated designs to completely revolutionized features, all of these additions meet with mixed reviews from the scuba diving community at large. Purge valves are one of the additions that are met with a lot of different opinions depending on who you talk to. Have you ever wondered what is a purge mask, and why is it such a controversial item among divers? Let’s learn more about what a purge mask really does and find out just why some divers love it (and others do not)! A purge mask is a specific type of diving mask that has a purge valve on it. A purge valve is a type of one-way valve that allows water to be easily pushed out of the mask but still doesn’t allow the water to come in at the same time. When you want to get water out of this type of mask, you do not need to lift it away from your face. Instead, you can simply blow air out with your nose and through the valve. This will take the water with it and out of the mask. As mentioned earlier, there are a lot of differing opinions about purge masks. While these masks are a pretty popular choice for many divers, there are others who believe purge valves should only be used while snorkeling as they are not safe for open water scuba diving. Now, why is it that there is this difference in opinion? The best way to understand the controversy between the two sides is to take a look at the various pros and cons of using a purge mask. Going scuba diving is quite complicated even for the most experienced diver. Most features that get added to scuba gear aim to make that experience less complicated. The purge valve is no different. The idea is that being able to purge water with this valve is much easier than the traditional water-clearing method that divers use, and to some extent, that is true! Purge valves make it so that you have one less thing to do underwater, allowing you to spend more of your energy and focus on the diving itself! If you like having your hands free at all times while diving for things like photography or videography, you will find that you enjoy using a purge mask. Because you do not have to grab the mask with your hands to clear it of water, you can keep your hands on your belongings. All you have to do to purge water is exhale, and you don’t need to use your hands to do that! Divers with contacts can have some trouble when using the traditional purging method. That is because clearing water can cause some pain or irritation of your contact lenses. This can be incredibly problematic when diving. Hence, those who wear contact lenses often go for the purge mask over a more traditional style. For divers who have facial hair or a mustache, it can be hard to get a snug fit with your mask, and you may find that water is always leaking in. When you own a purge mask, you can more easily keep your mask water-free even if you don’t always have the tightest fit on your mask. On purge masks, the valve is usually located at the bottom of the nose pocket. As with any added feature, there is always the chance that this valve could malfunction while you are diving. Most divers who use purge masks like to carry a backup with them in case this happens, but other divers don’t want to use a mask that they need to have a backup for. In the words of more conservative divers, one more feature is just one more part that can malfunction. The fewer parts a mask has, the safer the dive. Using a purge-style mask can make it hard to pinch your nose through the mask. While this might not seem like a deal breaker, many divers pinch their nose to make equalizing easier to do. The restrictiveness of this really depends on the specific mask. 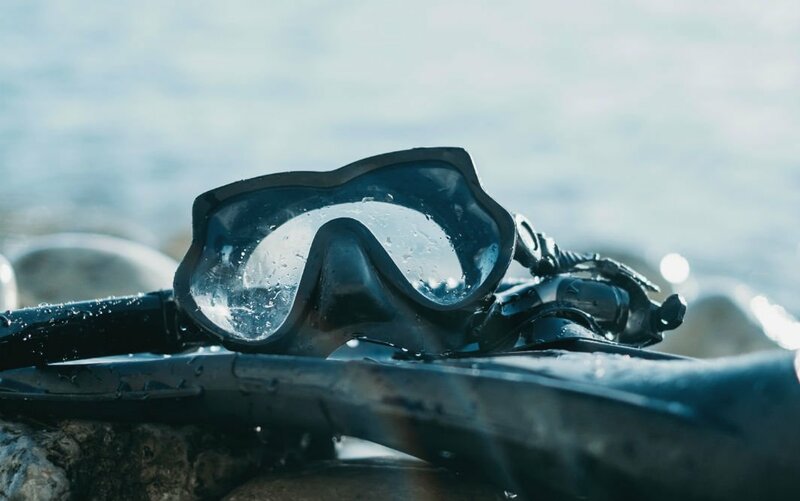 If you rely on pinching your nose while diving, then you might want to check out the specific purge mask that you are considering to buy before you make your final decision. The most cited reason for not enjoying the purge mask is because you have to keep it clean and clear of debris like any of your other equipment. It is possible (and probable) that sand will get caught in the valve at one point or another. If this isn’t cleaned out, you might get a leak through the valve, which is the issue that the valve is meant to prevent! Now that you know more about why some people choose to use purge masks and others choose to avoid them, you might be wondering which is ultimately the better choice. To answer this simply, know that, in the end, the choice comes down to what you need. There’s no way to say that a purge mask will or will not work for you until you give this technology a try. If one of your diving buddies has a purge mask that you can try out, give it a go in a controlled environment. Once you see what it is like to actually use a purge valve, you’ll find out whether or not it’s something that you’ll like to have in your arsenal. Now that you know what is a purge mask, you can make the decision about whether or not these masks are something that you want to try out. If you like the idea of freeing up your hands and having one less thing to think about, investing in a mask with a purge valve will give you that opportunity. The key when choosing any diving mask is to ensure that it is from a reliable manufacturer. You should also make sure that it is cared for properly so that it can last years. Otherwise, you run the risk of dealing with things breaking while you are out on a dive. As long as you do that, you shouldn’t have any malfunction issues!